Dr. Toni Rizk grew up in Ottawa and is now proud to serve his community. He graduated on the Dean’s Honours list from the University of Waterloo School of Optometry, after completing a Bachelor’s and Master’s degree in Organic Chemistry at the University of Ottawa. Dr. Rizk completed his internship at OMNI Eye Specialists in Baltimore, MD, where he managed various ocular diseases and provided refractive care alongside ophthalmologists of different specialties including cornea, glaucoma, cataract, retina and oculoplastics. 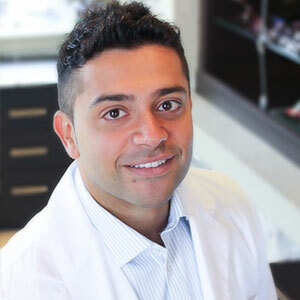 With a special interest in refractive surgery care and disease management, Dr. Rizk stays abreast of the latest research, technologies and treatments in the Optometry field and is fluently bilingual in English and French! • University of Waterloo – Doctorate in Optometry. • University of Ottawa – Bachelor’s and Master’s Degree in Organic Chemistry. Dr. Rizk’s professional interests include refractive surgery pre and post care and ocular disease management. Dr. Rizk is a car enthusiast and loves to travel!